COUPON CODE: MEMORIAL2018 AND TAKE 7% OFF SELECT ITEMS FOR RX7! As always we've gone to great lengths to get great rates to our customers out of the US. If there is something or something you're looking to get, don't hesitate to reach out and get a special rate quote. We're working with a few different shipping companies that may be able to help us get you larger items like BBK's at a much cheaper rate than you expect! 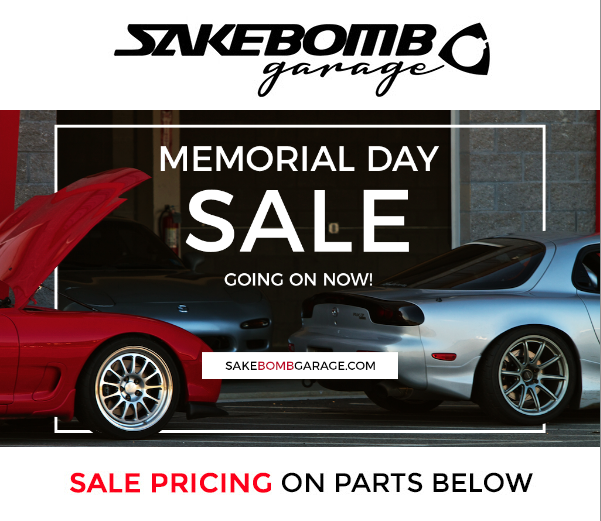 Take advantage of the deals while supplies last, all Sakebomb Suspension products are on sale! See something on the site that you want, but might not be in stock or on sale currently? Contact us! Send a message to [email protected] or use the Contact Form on the website to submit your inquiry. We do our best to respond as quickly as possible.Have a great, and safe, holiday weekend from all of us here at SakeBomb Garage! [For Sale] Memorial sale is now live on sakebomb garge! Quick Reply: Memorial sale is now live on sakebomb garge!